I would like to travel to an island where one can find squirrels. What are some of the possible locations for me to travel to? Requirements: I need to be able to visit the island on a South African passport. If I can get there on a visa then its fine. Smallest island that fits this requirement. Finding squirrels should be possible but can be on any range from easy to find to almost impossible. In other words, squirrel should exist on the island as a minimum requirement. Sorry for the strange travel question. Added the requirement for the smallest island to make this question more specific as the question was put on hold. Madagascar or Mauritius, both are islands and both have Indian Palm Squirrels. They aren't that far from South Africa too. This species of squirrels is not native to neither Madagascar or Mauritius, they were introduced in the 19th century. If you come to the UK, don't bother with grey squirrels, which are classified as an invasive animal pest species (introduced from the USA) and have almost wiped out the native European red squirrels. You can find grey squirrels pretty much anywhere in the UK in urban areas where there is a park with a few trees. Personally, I think the description of grey squirrels as "rats with fluffy tails" is quite accurate and appropriate, but since I lived in an area where I saw red squirrels almost every day when I was younger, until the greys exterminated them, I might be biased! There are at least three small islands around the UK coastline where you can see red squirrels: Plas Newydd on Anglesey at the "northwest corner" or Wales, and Tresco in the Scilly Isles off the coast of Cornwall, and Brownsea Island in Dorset. Although may not be the answer you were seeking, but UK would qualify. It's definitely an island a set of islands, there are lots of South Africans around here - you do need a visa but they are fairly easy to obtain compared so some other countries. And there are definitely lots and lots of squirrels here. In England now these are primarily grey squirrels, which in many places are considered pests (there's a saying about squirrels being rats with fluffy tails and good PR). They are everywhere: in forests, parks, cities - everywhere you find trees. Further north you can still find red squirrels. These are a lot more people-shy and you may need to search a bit to find them. Another not-frequently thought of island is Manhattan (part of New York City). Again, it's an island, you can visit with a visa and there are tons of squirrels there as well. I have seen numerous black squirrels around New York University in Washington Square Park. 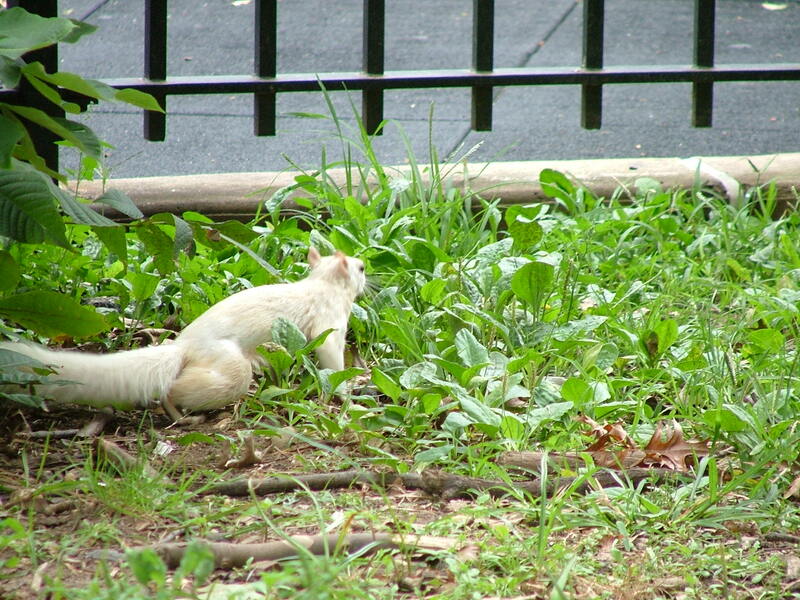 I even took the below (admittedly not very good) picture of a white squirrel in Central Park in Manhattan in 2006. Basically any island in temperate Europe with trees is going to have squirrels. For instance, I used to live on Angyali Sziget (Angel Island) in the Danube south of Budapest. No infrastructure, plenty of squirrels. But Angyali Sziget is 3 kilometres long, so it's by no means the smallest squirreled island in the neighbourhood. Perhaps you should re-think your selection criteria. Not the answer you're looking for? Browse other questions tagged where-on-earth nature-and-wildlife islands or ask your own question. Jeju Island (New Natural Wonder of the World) - How to Get There? “Tropical beach” in continental Europe? Where is the Hanuatu Island complex?